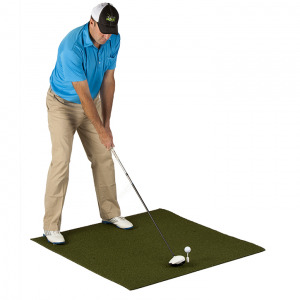 The PureShot PURE 4'x4' Golf Hitting Mat has 4 holes and 2 rubber tees included. If you have any questions regarding the PureShot PURE Golf Hitting Mat (4'x4'), please give us a call, we would be happy to help you with any questions you may have. Write an online review on the PureShot PURE Golf Hitting Mat (4'x4'), and share your thoughts with others.